Which Gout Walking Shoes are best? Which Gout Walking Shoes are Best is my featured image for Should I Walk with Gout. 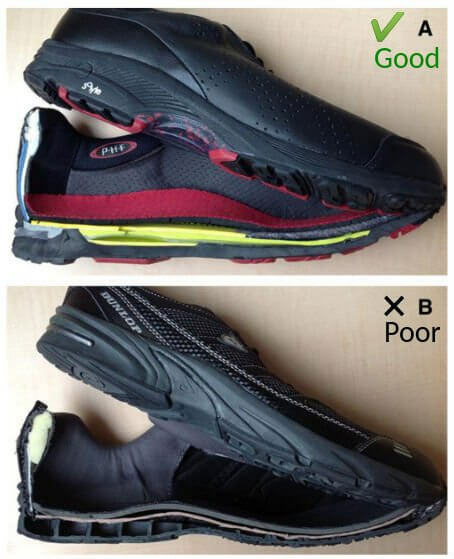 Because it shows the difference between good and poor gout walking shoes. So you should refer to my article for factors that make walking shoes good for gout. I took the original image from The effect of good and poor walking shoe characteristics on plantar pressure and gait in people with gout. Unfortunately, Asics no longer make the Cardio Gel Zip model featured in the gout walking study. However, I have found a close alternative. Because New Balance’s Hook and Loop Leather 928v3 Men’s Walking Shoes have similar features. I cannot find any suitable walking shoe with the zip fastening that allows easy putting on gouty feet. So I looked for robust alternatives with the Velcro (Hook and Loop) fastening system. Because I find these are the best type of shoes for my gout. Medicare / HCPCS code = A5500, may be eligible for Medicare reimbursement. Before you buy Hook and Loop Leather 928v3 Men’s Walking Shoes from New Balance you should consult your podiatrist and/or rheumatologist. Because you need a medical professional with access to your full medical history to assess if these shoes will help you walk with gout.